Berkery Noyes Represents Leeds Equity Partners In Its Purchase Of eInstruction Corporation - Berkery, Noyes & Co., LLC. New York, June 7, 2007 — Berkery, Noyes & Co., LLC, the leading independent investment bank serving the information and technology markets, announces that it represented Leeds Equity Partners, LLC, which has signed a definitive agreement to acquire 100 percent of eInstruction Corporation (eInstruction), a portfolio company of Chicago Growth Partners. Leeds Equity Partners is a leading New York-based private equity firm focusing on the education, training and information services industries. eInstruction Corporation is a leading provider of interactive instructional and assessment systems and content-based assessment software to K-12, higher education, corporate and military classrooms. The terms of the transaction were not disclosed. 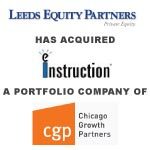 Leeds Equity Partners is a leading New York-based private equity firm focusing on the education, training and information services industries (“Knowledge Industries”). Since its founding in 1993, Leeds Equity Partners, through its various investment partnerships, has raised and managed over $650 million of committed capital and invested in approximately 20 companies. Berkery, Noyes is one of the pre-eminent merger and acquisition firms serving the information industry, and a market leader in the education space. The firm has completed more than 400 transactions since inception. Among its recent transactions are the acquisition of Monotype, LLC by Calvert Street Capital Partners; the sale of Psychological Services, Inc. (PSI) to ABRY Partners; the sale of The Teaching Company to Brentwood Associates; the sale of ELLIS (English Language Learners Instruction Systems) to Pearson; the sale of Questar Educational Systems, Inc. to TASA; the sale of The Hampton Brown Company to National Geographic; the acquisition of Delta Education LLC by School Specialty, Inc.; and ProQuest Company’s acquisition of Voyager Expanded Learning. Berkery, Noyes’ clients include privately owned, publicly traded and investor-backed companies in the broadly defined information content and technology industries. The firm is based in New York City with a staff of forty professionals. For more information, visit www.berkerynoyes.com.